I usually build models of the rip-snorting muscle cars of the ‘60s and ‘70s, but every now and then it’s fun to do something a little tamer, just for a change of pace. 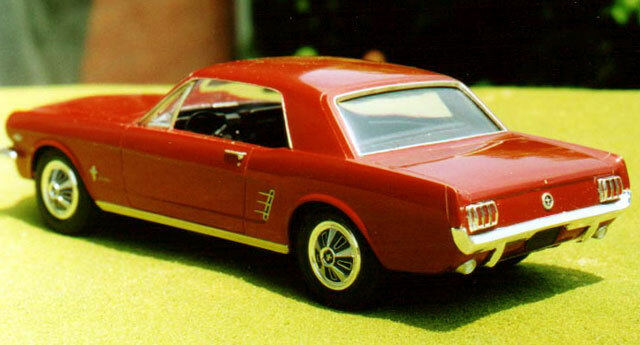 This is AMT’s 1/25 scale ‘66 Mustang Coupe, which has just been reissued yet again. It is built completely out of the box. I did scribe in the panel lines for the front and rear fender caps, which adds a lot to the realism of this model. Paint is Model Master Kiln Red Metallic over a primer of MM FS30219 Dark Tan (Vietnam-era airplane camo color). The Kiln Red does a very passable job of representing 1966 Ford Emberglow. The color coat was clear coated with Model Master Clear Top Coat and rubbed out with Wright’s Silver Creme, a mildly abrasive silverware polish. Interior and chassis are painted Model Master Black Chrome Trim, a great semigloss black. The engine is, of course, Model Master Ford Engine Blue. All chrome trim is Model Master Silver Chrome Trim. I especially enjoyed detailing the kit’s distinctive ‘66 Mustang wheel covers using Flat Aluminum and Gunship Gray paints.